while it rains: December Fourth, Where Did You Come From? December Fourth, Where Did You Come From? It's a little hard to wrap my mind around the fact that it is already four days into December. Twenty-one days until Christmas. Does anyone else feel like they were robbed of that nice lazy week in between Thanksgiving and the onset of December that we are usually spoiled with? Honey, quick get the lights out, trim the tree, oh my gosh bake all the things. Our tree did go up a couple of weeks ago but didn't get dressed up till last Sunday night due to no one wanting to run to the storage unit. Stella can't stop dancing around it and Robin watches for us to walk away and then snatches the big My Little Pony ornament and runs. It's a nice system those two have down. We're all Christmas as frack around here now. Let all the traditions commence! We don't really get into the whole advent spectacle, other then the Trader Joe's chocolate ones for a dollar, but one of these years I would like to try a Christmas book one.That doesn't stop me from loving on some I have seen around the internets like this, this, or this. Still, in the spirit of it all we have drafted a fun list do day-to-day activities we would like to do to keep the holiday fun alive and kicking. Stuff, stamp, and mail our Christmas cards from Pinhole Press! Dream up and create fun gifts for the teachers, school staff, and bus drivers in our life! See as much family as possible! I am sure there will be a lot of spontaneous additions to this list but it's a good start! In other news, we are done shopping for the kids! It happens pretty seamlessly when you nail a minimalist Christmas with just a couple of gifts they'll flip for. It worked out so good for us last year that they are even getting one less this year. Ok, Stella got a little more spoiled because the big girls are at their dad's on Christmas and it is crazy cute when Stella opens presents. I know, shame on me. This Sweater from Spool72. Oh, Lordy i'm obsessed. This velvety delicious accent chair from Target that's on sale now! A custom chalkboard sign by kaelah bee - "Rohr Baby Farm EST 2003"
An iPhone 5S, I mean I don't really need one. But, camera. Anything from Khiel's. The only brand that loves my weird combo skin. Still need to order your Christmas cards? Pin hole press goes above any beyond with their selection and quality. It doesn't stop there! 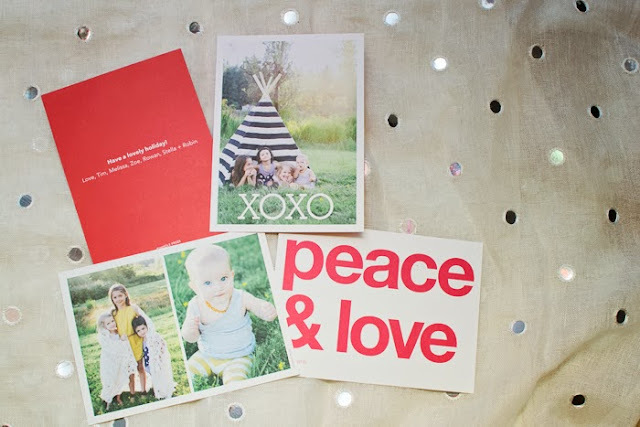 They have tons of gorgeous photo gifts to choose from - Calanders memory games, prints, and more. I can hardly contain my excellent to give someone this puzzle as a gift this year. When ordering our cards and puzzle I experience the most wonderful customer service and was blown away with how fast our items came. Nice and thick and ready for traveling to our family all over the country. Sounds like a great list to me. I added "deliver treats to the fire dept." to our list after seeing it just now on yours. And those cards are awesome!